This site is intended to make available new products as the are released by manufacturers. Rimfire accessories maker TandemKross teams up with Tactical Solutions to offer Browning Buck Mark pistol fans a custom barrel in the form of the #Tandemized Trail-Lite. The #Tandemized Trail-Lite is a 7.25 inch fluted barrel that utilizes a balanced, lightweight design to improve accuracy. The threaded barrel can also accept the addition of a compensator to further improve shots down range. TandemKross Business Development Director Bryan Haaker said the company is extremely excited to partner with Tactical Solutions to bring youth and competition shooters this unique barrel for the Browning pistol. The Buck Mark upgrade comes in a fluorescent TK Green color only available through TandemKross. Retailing for $249.99, the #Tandemized Trail-Lite barrel will surely turn heads on the range. Authorities have found three improvised electric weapons in the past month in the Canadian province, which officials warn could be lethal. As reported by CBC, the devices were found in separate incidents including two at traffic stops in December and the arrest of a 18-year-old man on New Years Day on a list of drug charges. The devices are kinda moody, with no guarantee just how much juice comes out, which could result in a dangerous situation. What if you had to choose to live with only one handgun? This handgun would have to fill the roles of self-defense and hunting. Obviously, this is a very personal choice and is dependent upon a number of conditions which will be discussed below. I am also not out to start a “handgun selection war” with the readers. However, if by choice, financial reasons, or because of political and legal and decisions you or I were ever forced to choose just one handgun it begs thoughtful discussion. Here are my thoughts for just one handgun. My pick for the best one handgun to own would be a Ruger GP-100 in 357 Magnum. The GP-100 is a built like a tank, will last forever if well maintained, can stand up to a steady diet of hot loads and has a good action. They handle well and are generally accurate if the shooter does his or her part. The 357 is a logical choice as it can fire everything from mild 38 Special wadcutters to heavy 180-grain hard cast loads. It can effectively handle small game, big game (within reasonable limitations), and self-defense from both two and four-legged creatures. While it’s a large handgun, with a four-inch barrel and a good holster, the GP-100 is still concealable. There is no task in my part of the U.S. the 357 cannot handle if I do my part shooting it. A close runner up to the Ruger GP-100 is the S&W 627. I’ve always liked S&W revolvers and carried one on duty for years. Also available as the 686+ with a seven round cylinder, the L-frame Smith is a formidable handgun. If ammo capacity is your primary concern, the S&W 627 holds eight rounds of 357 Magnum in its larger, N-size frame. While the GP-100 may be slightly stronger, any of the aforementioned revolvers would likely outperform and outlive the shooter. 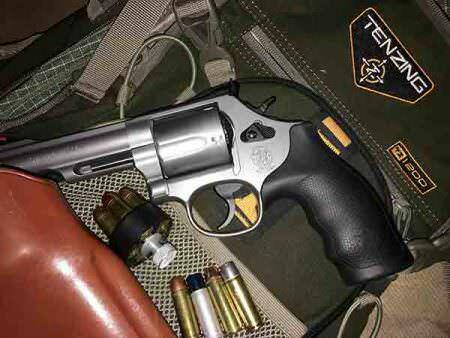 If ammo capacity is not a concern and concealability is, a five-shot, 4” barreled Ruger SP101 may be the route to go. If I lived somewhere where big toothy creatures roamed I might opt for something a bit different. Perhaps a Ruger Redhawk in 45 Colt/45acp, a Ruger Redhawk in 44 Magnum/44 Special, or maybe my L-frame S&W Model 69, five-shot 44 Magnum/44 Special. One’s environment has as much to do with handgun selections as any other factor. One has to consider where his or her travels will take them and what threats they are most likely to face. If big bears are a regular threat then I want my handgun to be chambered in a round beginning with “4” and able to fire hard, deep penetrating bullets weighing 200 grains or more at 1000fps or more. 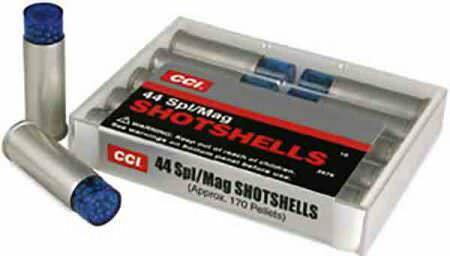 CCI Shotshells in 44 Magnum/Special and especially those in 45 Colt are impressive performers and work well on small game at short range. The revolver is definitely versatile. I am not disparaging single-action fans. I own several and love to shoot and hunt with them. I also understand the limitations of a single-action in defensive scenarios and the inability to rapidly reload them. With that said, if it works for you, great. My single-action caliber selections would likely remain the same as mentioned previously with my double-action revolver choices. From a versatility standpoint, a Ruger Blackhawk chambered in 357 Magnum can also be ordered with a 9mm cylinder meaning one gun can shoot 357 Magnum, 38 Special, and 9mm. This level of versatility is hard to beat. By the same token, a semi-automatic handgun is a great choice for defensive shooting and even for hunting. My various Glock 10mms see time in the field each year and I love my Glock 17 and Glock 26 for defensive work. While 9mm ammo is plentiful it is not an effective big game hunting round. Sure, it’s been used to take deer and one well-known outdoor writer recently used one to stop a bear attack in Alaska. but it’s not the best for this type of field work. There are better choices. The 10mm Ammunition is an effective fight stopper and hunting round but ammunition can be hard to find off the shelf at times and practically speaking, you are limited to shooting 10mm, unlike revolvers which can often fire at least two different cartridges without modification. I have a strong affinity for the 10mm and while it can do so much, if forced to pick just one handgun, I believe I’d default to the revolver. Shotshells work best from a revolver and add a new level of versatility. Have you ever considered your “one handgun choice”? There are no wrong or rights; only you can make the call on what you believe would best suit your needs. Thankfully, we are not limited to owning only one handgun (at least for now) but this is still a good exercise to consider should for some reason scaling back becomes a necessity. We got a first hands-on look at the newest in an upcoming family of CZ pistols, the CZ P-10 C or Compact. The CZ P-10 C is a polymer-framed striker-fired mid-size service pistol that aims to outperform even the most competitive and featured next-generation poly pistols. It’s true, the pistol looks like it’s a real problem-solver. The P-10 C built with concealed-carry, home defense, competition and duty in mind. The P-10 C sports fully-ambidextrous controls with magazine and slide release buttons on both sides. The slide and frame have a familiar profile and are compatible with “common” holsters. The magazines are similar, too. Standard magazines offer a 15+1-round capacity and extended magazines will provide 17+1. According to CZ the striker-fired P-10 mag bodies are the same as the hammer-fired P-07 and P-09 design. They are backwards-compatible with the earlier P-series pistols. The main difference is a new cutout pattern for the new magazine catch on the P-10. CZ has three models in the works to launch with, the standard P-10 C, the P-10 C Flat Dark Earth two-tone model and the P-10 C Suppressor-Ready model. The company expects to have .40 S&W variants in standard black and flat dark earth out in mid-2017. The .40-caliber models will have a standard capacity of 12+1. All steel surfaces have a black nitride finish. Of course, the real difference between a leading service pistol and a commanding one isn’t going to be the feature set, it’s going to be the trigger. That’s where CZ expects to come out on top. The P-10 C trigger is short with a quick, positive reset and a 4-to-4.5 pound break. That’s on-par with custom carry aftermarket triggers and entry-level competition triggers. Putting that in perspective, the bulk of today’s next-gen striker-fired service pistols have triggers that measure in the 5.5-7.5 pound range. A shorter, lighter trigger means more consistent accuracy and faster follow-up shots. Testing in the real world will tell how well these promises hold up but this is CZ, one of the most trusted names in self-defense, competition and military firearms manufacturing. It would be surprising, to say the least, if CZ fell short. The P-10 C’s other features are also very modern, including three interchangeable backstraps, front and rear slide serrations and 3-dot ledge-style night sights. These sights can be used as a hook for racking the slide one-handed. It has a squared trigger guard for shooting off barriers and a deeply undercut beavertail that stops at the rear of the slide. By Philip Smith – President National African American Gun Association. Yes right here in the USA and they are thriving. 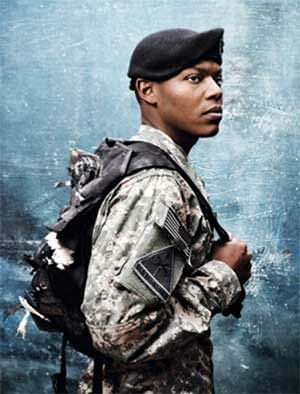 The company was founded by Yonas Hagos who is a USA Army Veteran and Purple Heart recipient. The company is delivering a World Class AR-15 platform that is dependable and performs at a quite a high level. Yonas Hagos, a child refugee from Sudan, has always dedicated his life to serving his country and others. After being wounded by a rocket propelled grenade in Iraq during the height of the war in 2004, Yonas became an avid community volunteer and entrepreneur. Volunteering as a Mission Continues Fellow, he along with other post 9/11 Veterans dedicated their time and energy to rebuilding communities across the nation. Soon he turned his drive to serve into business, launching three successful businesses helping to employ fellow Americans. This is a solid Veteran owned organization that the NAAG community needs to support “Nationwide” and buy products from. They are based in Illinois. The goal of the National African American Gun Association is to have every african american introduced to firearm use for home protection, competitive shooting, and outdoor recreational activities. We are a civil rights organization focused on self preservation of our community through armed protection and community building. 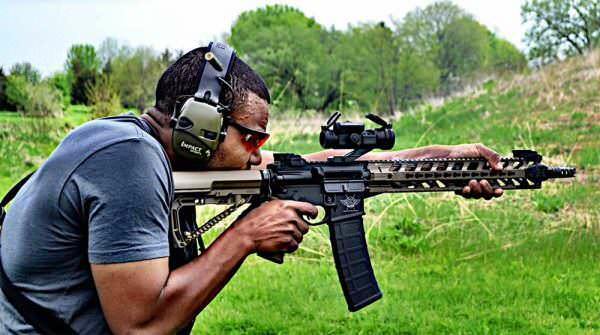 The National African American Gun Association provides a network for all african american firearm owners, gun clubs and outdoor enthusiasts. We welcome people of all religious, social, and racial perspectives. We especially welcome african american members of law enforcement and active/retired military. USA -(Ammoland.com)- National Rifle Association President Allan Cors is, of course, no stranger to firearms. Throughout his career, first as an attorney and later his work at various echelons of leadership within the NRA, he’s worked tirelessly to protect the Second Amendment and support the shooting sports culture in the United States, culminating in his election as the 63rd President of the organization. “I knew how to shoot the M1 Garand, but wanted to learn how to shoot it well,” he recalled. Both these beloved pieces of Cors’ collection are currently on long-term loan to the NRA Museums for visitors to enjoy in the exhibits. Today’s hunters seem to continually seek the most modern, most effective weapons, be it long range rifles, crossbows, or in the black powder family, the latest in-line, long-range muzzleloaders. Never one to rest on its laurels, or in this case, its super-successful Encore line of muzzleloaders, T/C has debuted a new-and-improved black powder rifle. Has the company indeed improved upon one of the best, or is the Strike just a flash in the pan? The Thompson Center Strike is a .50 caliber, striker-fired muzzleloader that was initially sold as the LHR Redemption. Since the time that T/C was been bought out by S&W, and the rights acquired, the rifle has been re-stocked, and remarketed as the Strike. Sleek lines and the forward jutting trigger guard scream “modern” but it’s the firing features that set the Strike apart from most other black powder guns. A new “Adapt” breech system moves the threads to the outside of the barrel, theoretically eliminating seized breech plugs and simplifying the cleaning process. There are also a pair of included threadless primer adapters that hold the 209 primer. One adapter is made for use with loose powder while the other is specific to formed pellet propellants. T/C’s Armornite metal finish is essentially a nitride coating on both the outside and the inside of the barrel, and T/C advertises increased barrel life through corrosion resistance. The 24” barrel has 1:28” RH twist rifling, touted to be ideal for today’s high performance projectiles and modern sabots. Also setting itself apart from other muzzleloaders, including the Encore, T/C’s new “Stealth Striker” ambidextrous cocking system replaces the standard hammer. In the end, the sliding striker should be more quiet and less intrusive than standup hammers, which can interfere with optics. A center “decocker” button allows the striker to be moved out of the fire position, essentially operating as the gun’s safety. A match grade trigger is standard on all models of the Strike, and immediately sets it apart from most black powder rifles. Adjustable fiber optic sights are included, as is a Weaver scope base. Taking a page from the Pro Hunter book, the Strike also incorporates the T/C Quick Load Accurizor muzzle system, which essentially means there’s a false, rifle-less section at the muzzle allowing projectiles to be seated squarely and evenly for maximum accuracy potential. The whole package comes with T/C’s Limited Lifetime Warranty for the original purchaser. There are currently three models of the Strike available: a black synthetic, a G2 camo, and a Walnut with MSRPS at $499, $549 , and $599 respectively. Our test gun came broken down and neatly packed in a small cardboard box. We mounted a middle-of-the road Bushnell 3-9x optic, and headed to the range. For accuracy testing, we were shooting both Blackhorn 209 loose powder and Triple Seven pellets, partnered with Hornady FPB 300 and 350 grain bullets and Power Belt copper 245 grain bullets. Accuracy was greatly aided by the trigger pull, which breaks cleanly at 3lbs-12oz on the Lyman digital gauge. Average three-shot 100 yard groups were 3.32” with field cleaning after every five shots. The best three-shot 100-yard group was 2.65” with Hornady FPB 300 grain projectiles and 110 grains Blackhorn. Shooting pellets more than six shots without cleaning opened three shot groups over 5.75 inches. It’s also important to remember that the hand-pulled primer adapter must be changed out whether using loose powder or palletized, and should be kept well lubed, lest removal become a real treat. Weighing just over 8 pounds with a scope, recoil with 100-150 grains feels more stout than it does with the Pro Hunter’s Flex Tech stock, though the Walnut stock adds to the rifle’s overall looks. In fact, between the walnut furniture and the sleek lines of the muzzleloader, it looks at first glance more like an O/U shotgun than a smoke pole. T/C’s Armornite coating is nice on the exterior but even better on the interior. We have all seen horrific looking bores and barrels of poorly cleaned muzzleloaders and while there is no replacement –or excuse—for an improper cleaning, a little extra insurance never hurts and can only improve overall barrel life. Though it pained me greatly, I let the fouled Strike sit for 12 days before cleaning, and needless to say, it cleaned up no worse for the wear with neither rust nor pitting in the barrel. The match grade trigger is the best we’ve tested on a black powder rifle, and even better than some on some of today’s centerfire production guns. The fact the Strike is made in the USA is a big plus, as is the company’s decision to include not only fine fiber optic sights, but also a Weaver base. The Stealth Striker design eliminates issues with hammer/scope clearance, though it was neither noisier or quieter than a standard hammer, and in fact required a very strong forward push to engage. Overall, the gun balances well, is easy to load, and has plenty of features that are sure to appear on future smoke guns. While I really (really) wanted to love this gun and replace my ProHunter muzzleloader barrel with this walnut stocked, modern smoker, things just didn’t shake out. Right out of the box, the forend would not fit with the barrel mounted on the receiver. It fit fine on the barrel alone, which made it clear there was a fitment issue between barrel/forend combo and receiver. As we could not reach the company for a timely replacement, we slightly widened the hole in the walnut forend and allowed it to function as intended. The second major problem came with the rod. There was no retention to keep the cleaning/loading rod in place. If the gun was tilted muzzle down, or even upon firing, the rod would slide right out, and in most cases, fall out completely. We could not find the culprit or any loose retention parts, nor could a licensed gunsmith. A further strike against the Strike was the company’s non-response to our attempt to reach customer service for rectification. The trigger guard and forend trim are plastic/synthetic and not feeling especially durable. Overall fit and finish was average, but not great, and nowhere near the quality of the Pro Hunters, though neither is the price. Had I not been in a committed relationship with my ProHunter, I may have found more adoration for the Strike. But having shot what I consider the best, there’s no way to consider the Strike an outright improvement. T/C is on the right track, however. There are lots of features to like on the Strike, from the inside/outside Armornite coating, match trigger, and Adapt breech system. The bases are loaded, the count is full, and the T/C Strike has all the potential to be a homerun.